My Rights, Your Rights – Who’s Right? Michael on ISIS or Islam: Which Breeds Terrorism? We strongly endorse Kelly Canon for City Council District 1. Ms. Canon is the only conservative candidate that will act for the citizens. Four seats of the Arlington City Council are up for election this coming May. However, only two are contested. They are city-wide, at-large District 7 and single member district of north Arlington, District 1. Only one of the two AISD board positions is contested. That is Place 4. Monday, April 25, Early Voting for Municipal and School Board Positions Begin. Tuesday, April 26, City Council meetings, Arlington City Hall, 101 W Abram St, TBA. Theater, E.H. Hereford University Center, 300 W First St, UTA, 10:00am. Wednesday, April 27, Arlington Alliance for Responsible Government (AARG), Cokers Bar-B-Q, 2612 W Pioneer Pkwy, 6:30pm. Tuesday, May 3, Early Voting for Municipal and School Board Positions End. Thursday, May 5, AISD School Board meeting, AISD Administration Building, 1203 W Pioneer Pkwy, 7:00pm. Saturday, May 7, Election Day for Municipal and School Board Positions. 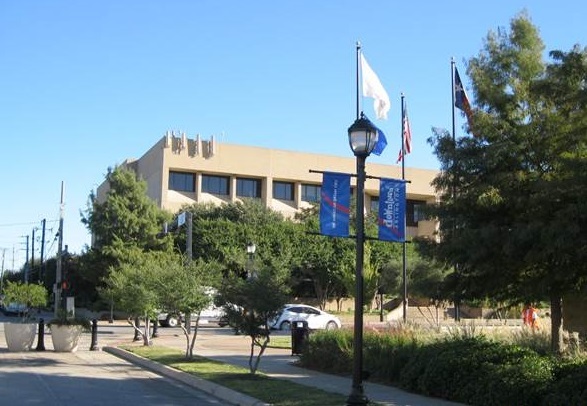 Tuesday, May 10, City Council meetings, Arlington City Hall, 101 W Abram St, TBA. Monday, May 16, Early Voting for Primary Runoff Positions Begin. Friday, May 20, Early Voting for Primary Runoff Positions End. Arlington is a city where citizens are relegated to being spectators rather than players. The SPECTATOR helps citizens know what is happening on the field. Only the few on the in-house team are allowed to play ball in Arlington. The SPECTATOR helps citizens understand the game. The city council will meet again this Tuesday, April 26. Committee meetings start at 11:45am. At 2:00pm the council meets as the Arlington Tomorrow Foundation Board. The afternoon session opens in executive session at 2:45pm (open session 3:30pm or later). The evening meeting is at 6:30pm. The first committee (11:45am) has two agenda items, neighborhood matching grants (15 minutes) and erosion program (45 minutes). It looks as if they are planning to try to grab a bunch of the storm water money, which lacks the funding to do everything. The second committee (1:00pm) has two agenda items, airport update (15 minutes) and an executive session discussion of lease and acquisition of property relating to the Arlington Municipal Airport (15 minutes). The council is scheduled to meet as the Arlington Tomorrow Foundation Board at 2:00pm for a quickie, less than 15 minutes scheduled time. They are to discuss and approve a River Legacy Foundation Grant. (I could not find any details on the grant request online). The 2:45pm afternoon session will open in executive session. The executive session has four agenda items, including more offers of incentives to business prospects. Hold onto your wallets. The open portion of the afternoon session is scheduled to start at 3:30pm (or later). There are two work session items and five informal staff reports. The presentations of the two work session items, North Texas Tollway Authority (NTTA) update and Gas Well update, can be found in the above link. All five informal staff reports can also be found in that link. One of the five informal staff reports is an MAX update. Amazingly, staff again has created a chart with of MAX ridership numbers, and though the numbers are clearly going down, have created a gently increasing red line to suggest that ridership is on the rise. The evening meeting starts at 6:30pm. The agenda includes one executive session item, two sets of minutes, 24 consent agenda items, and three public hearing zoning cases. $5.8 million for repaving portions of Green Oaks Blvd and Little Road. $650,000 for 150 handheld devices to write tickets (sole-source provider/over $4000 each). Establishing fees and registration process for donation boxes. Directing Oncor regarding just and reasonable rates. The next AISD board meeting will be Thursday, May 5. Early voting starts today, Monday, April 25 for city council and school board elections. Early voting ends Tuesday, May 3. Election Day is Saturday, May 7. The Arlington Spectator strongly endorses challenger Kelly Canon for District 1. Ms. Canon is the only strong conservative running for council and easily the best candidate in this race. In the District 7 race, we recommend Chris Dobson. He would better represent the typical resident vs. the high-roller special interests. In the AISD Place 4 race we lean towards Luis Castillo. We believe that Mr. Castillo gives an added prospective into the board’s decisions. I have known both candidates for years and also like Mr. Hibbs. However, it still irritates me how certain things happen, like tax dollars being used for special academies. There were several major issues decided by a bond election that was sold as “needs” by the schools/students, with no discussion of other issues. http://www.opinionarlington.com/?p=9649 The hearing is Wednesday, April 27th, beginning at 10:00 a.m., and will be held at the University of Texas at Arlington (E.H. Hereford University Center, Rosebud Theatre, 300 West First St., Arlington, TX 76019). Arlington Alliance for Responsible Government will hold its meeting this Wednesday, April 27. The guest speaker will be the city’s Economic Development Director, Bruce Payne to discuss the Texas Live Deal with the Texas Rangers. The paving of Cooper Street is to start on Sunday night April 17. Work is to be done at night and will start with the Arkansas Lane to I-20 section. There are two contested races in the upcoming May City Elections. District 7 is an at large seat, city-wide and will NOT have an incumbent. The candidates are Victoria Farrar-Myers and Chris “Dobi” Dobson. The other contest race is in North Arlington where incumbent Charlie Parker is being challenged by Kelly Canon. The two uncontested races have the returning incumbents, District 2 (Sheri Capehart) and District 6 (Robert Shepard). The one position contested on the AISD Board is Place 4. The incumbent John Hibbs is being challenged by Luis Castillo. Jamie Sullins, the incumbent in Place 5 is unopposed. This is the final question in our series. Early Voting for the city council and school board races start this Monday, April 25 and ends Tuesday, May 3. Election Day is Saturday, May 7. In your opinion, are further improvements in school security needed? If so, please describe and explain possible funding. John Hibbs, incumbent, AISD Place 4 It is absolutely necessary to constantly review security and safety procedures. The AISD meets regularly with the APD, State, and Federal officials to review Safety and Security plans. This includes the need for additional officers, resources and security personnel. The Board re- views with the Administration all recommendations. Safety is first and foremost to every Trustee and Administrator. It is important to rely on the experts to lay out security needs and action plans and inform the board what is most appropriate. The APD is among the finest in the nation and I respect the plan that they have helped to develop for our schools. Luis Castillo, challenger, AISD Place 4 A resounding YES for security improvements. Particularly at our elementary schools. Anyone who says that no improvements are needed is in all likelihood sadly out of touch with the real world. massacre at a given school, which school do you think he’ll choose to carry out his evil crime? A school with access control entry and video surveillance camera systems or a school with a police officer on campus? This is not rocket science. Remember the Sandy Hook elementary school massacre that occurred almost 4 years ago? Well, that school had entry control and a video surveillance camera system in place. That didn’t stop the intruder. What stopped the intruder was the presence of a police officer. Four minutes after the shooting started, the first police officer arrived at Sandy Hook elementary school. Within a minute, the shooter shot himself. However, in approximately four minutes the shooter managed to kill six women adults and 20 children ages 6 or 7 years old. AISD elementary schools have access control entry and video surveillance camera systems. They do not have a police officer stationed on campuses. Why not? Simply put, because it costs money. Someone may have decided that it’s better to take chances with the lives of our kids and staff then to address a security deficiency. The complacent atmosphere is so prevalent on the Board of Trustees and the administration that that in itself is a security threat. The reality is that elementary schools are vulnerable to external threats. A peace officer at elementary schools would be a huge security improvement. The peace officer’s main purpose would be to deter and confront external threats. It will offer our kids and staff a chance for someone to defend them from external threats. Seek joint funding between the city and the school district. Sell unused real property and set aside property tax generated to security. Eliminate the one million dollar plus senior administrators recently added and allocate funds to security. Eliminate across the board pay raises (excluding teachers) and allocate savings to security. Allocate portion of year-end budget savings to security; and Seek grant opportunities. $70 per student per year is asking too much to provide security to our most valuable resources – our kids. The citizens of Kennedale were not watching their city council. Now they are very upset and will be paying hundreds of dollars per year more in utility bills. All of the candidates in this year’s Kennedale’s municipal and school board elections are unchallenged. In fact, one of the school board positions required the convincing of former mayor John Clark to run for the position. Three weeks ago, Kennedale’s citizens and businesses got their water bills. Those bills were shocking. Depending on the size of their connections for water and sewer, the charge was much higher, some more than doubling. What had happened was in a very under-publicized way, the city council had increased the rates. Needless to say, the citizens were not been watching what their council was up to. This is a city council that basically approves staff’s requests with little or no questioning, and certainly with no challenge. The city’s new billing formula leans heavily on the fixed monthly charge which is now more than double many other city rates. The city manager justified the increased, arguing it was necessary due to decades of poor maintenance, a $700,000 emergency repair, a need for service expansion, and a depleted fund balance related by low usage due to the result of heavy rains. The fund balance replenishment should take 2.5 years at the new, greatly increased rates. Unbelievably, the city manager does not think that this pricing disaster will have any effect on his “baby,” economic development. What out-of-control city council/city manager will abuse its citizens next? Richard Weber, publisher of the Arlington Spectator, is that rare citizen who devotes time to civic duty and involvement. For doing so, he receives little thanks. Most citizens have more important things on their minds—TV, football, enjoying their retirement, etc. Not Richard. You’ll find him at City Council afternoon and evening sessions, at school board meetings, publishing Arlington Spectator, and helming AARG (Arlington Alliance for Responsible Government). Richard is a citizen who believes taxpayers should have a voice in government and his selfless effort is one of the things that inspired us to begin publishing Opinion Arlington. Feel free to forward this column to family and friends. Ready to put your two cents in? Comment online and/or…. email the entire City Council with one click!